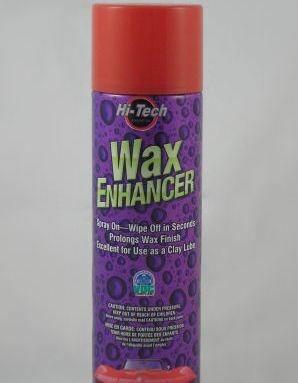 HT 19040 Wax Enhancer. With its blend of next generation cleaners and polymers, Hi-Tech Wax Enhancer is the product choice for putting a quick shine on showroom cars. The car enthusiast will find Wax Enhancer to be a must-have for removing dust, smudges, and fingerprints prior to and during car shows. Just spray on and wipe off. Safe for all automotive finishes. Also makes an excellent lubricant for clay bars. Aerosol can net weight 19.25 oz. California / OTC VOC Compliant.